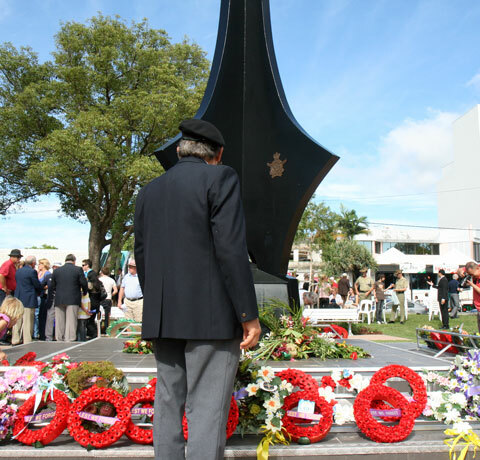 I got woken very early by people making sandwiches, then a bit later, to rush down to the ANZAC Day ceremonies. Bronwen’s Grandfather took pride of place, representing prisoners’ of war. After a lunch with Bronwen and her family and relatives and friends, overlooking the stunning view across the Sunshine Coast, then drove down to the beach for a walk and a swim, then back to Brisbane. Bronwen and I enjoyed a very eatable vegetable biryani from Halim’s. Bronwen and I drove to South Bank, meeting Amanda there a stressful while later—she’d not been able to find parking. We then went and watched “How to train your Dragon” in 3D, which was surprisingly good, though the cinema was full of kids who had already seen it. I drove over to Maz’s to drop off some media while Bronwen packed. Now, bed. What a stressful night. After being told some time ago to put in leave applications, at least tentatively, for any significant leave for the rest of the year, and then not putting any in and being quizzed on that and responding that I was saving up my leave for a large holiday next year—today I get told I’ll have to take two week’s leave prior to the end of the financial year, and advise as soon as possible if I want any significant leave next year. This seems ok, until I remember that I have a meeting with the boss tomorrow to discuss a performance appraisal, and that this is going to come up in that meeting, so I effectively need to plan out my next year’s holidays, tonight. I also need to pick Kara up from band practice at 9:30, and drive Bronwen to her place and back before picking up Kara, and pack for Darwin, then ideally entertain Kara and eat some dinner once I get Kara… all while working out my next year’s leave plans—which is large enough that it may impact on my career decisions, so I’m working out next year’s career decisions… argh. So I drive to Kangaroo Point, where Bronwen is climbing, to see if I can start discussing plans for next year’s leave, and what I should do with my career, and life in general, only to find that she’s just about to leave and has her bike so I can’t give her a lift. So I drive home and meet her there. Then, on the way back from Bronwen’s, where it took longer than expected, we find that the expressway has been reduced to one lane—so what should have been not too much more than half an hour, takes us an hour and a half, and we’re late picking up Kara, and after Windmill’s pizza, by the time I get around to starting to pack, it’s after midnight. So I postpone packing until tomorrow, where I really don’t have time, and go to bed. Created about 8 yrs, 9 mths ago (July 13, 2010). Updated about 7 yrs, 6 mths ago (October 22, 2011).